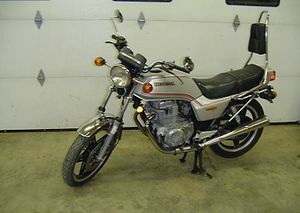 The Honda CB400T was a parallel twin engined motorcycle made by Honda beginning in 1978. 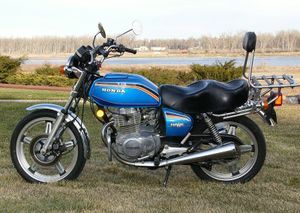 Having introduced the first four-cylinder motorbikes for the 350; 400; 500; 550 and 750 -classes, Honda seemed to take a step back with this parallel twin with classic 360° crank-layout. 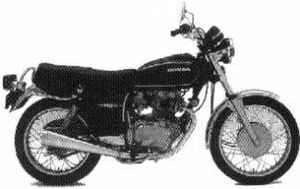 Nevertheless the engine showed to be reliable and sturdy and was to be a long living design used in all Honda's 400 & 450 twins for the next 10-15 years. 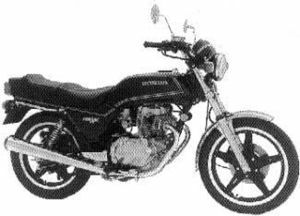 The distinctive engine, came with a 360° crank; Heavy over-squared cylinder-layout; 3-valve design of the combustion chamber, tandem balance-shafts in the front left side of the engine and CDI ignition. 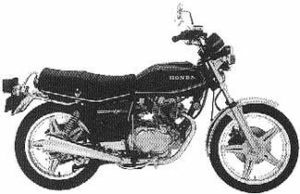 Beside of this, during time, almost classic engine, the CB400T also introduced the so called "Com-Star" compound aluminum-rims, using tubeless tires for the first time - This together with the other models of same year mounted with the remarkable Com-Star rims! 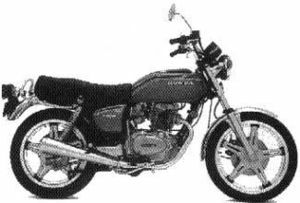 The rather stubby design of the CB400T changed when Honda short after introduced the new "Euro-line" -design with the CB900 Bol d'Or. 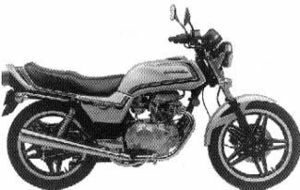 In the meantime it was launched in a version with the same design as the CX500 costume: The CM400. Later was the engine changed to 450ccm in the hunt for bigger torque, meanwhile the power remained the same. 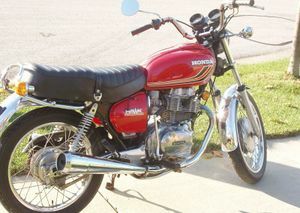 The CB400TII'78 was sold in 1978 in one of two colors: Tahitian Red or Candy Sapphire Blue. The gas tank and side cover stripes were black and orange. The instruments had both a speedometer and a tachometer. The bike had comstar wheels rather than wire spokes. 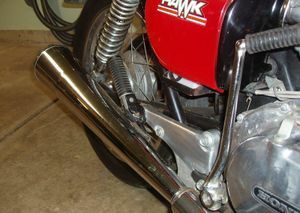 The front brake was a hydraulic operated disc. It had both an electric starter and a kickstarter. 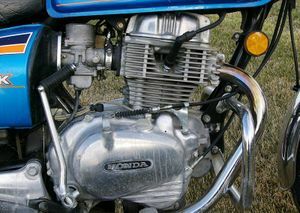 The engine was a 395cc OHC 3-valve parallel twin with dual carburetors. The transmission was a 5-speed. It came with both a side kick-stand and a center-stand. 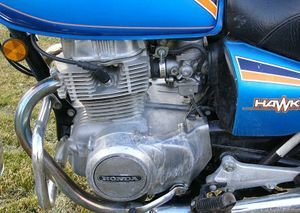 The serial number began CB400T-4000048. 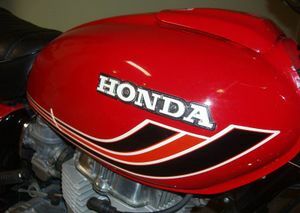 The CB400TI'79 was sold in 1979 in two available colors: Candy Antares Red or Excel Black. 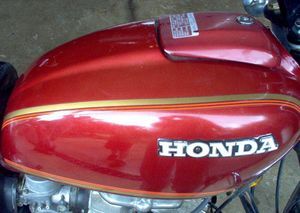 The gas tank and side cover pinstripes were gold and orange. There was no tachometer -- only a speedometer. The wheels had wire spokes and the brakes were mechanically operated drum. 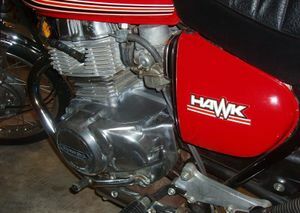 There was only a kickstarter (no electric start) The engine was a 395cc OHC 3-valve parallel twin with dual carburetors. The transmission was a 5-speed. 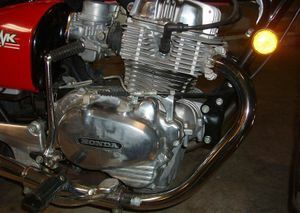 The serial number began CB400T-2100006. 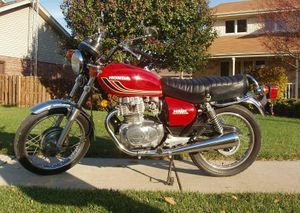 CB400TII'79 was sold in 1979 in one of two colors: Candy Antares Red or Black. The gas tank and side cover stripes were gold and orange. The instruments had both a speedometer and a tachometer. The bike had comstar wheels rather than wire spokes. The front brake was a hydraulic operated disc. It had both an electric starter and a kickstarter. 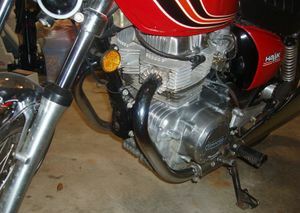 The engine was a 395cc OHC 3-valve parallel twin with dual carburetors. The transmission was a 5-speed. 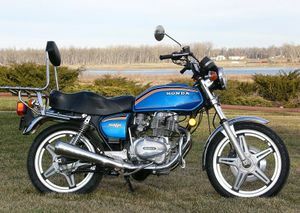 The serial number began CB400T-4100001. 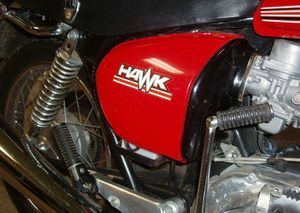 The CB400T'80 Hawk was sold in 1980 in two available colors: Custom Silver Metallic or Black. The pinstripes on the silver bike were red and black; but on the black bike they were orange and yellow. The wheels were solid black comstar. The brake caliper had a single piston. 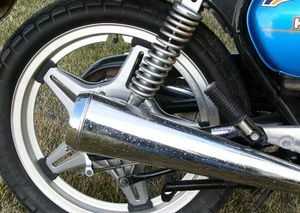 The front fender was chrome plated steel. 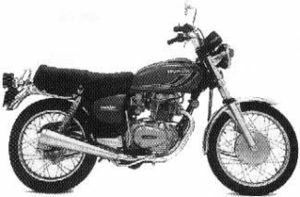 The engine was a 395cc OHC 3-valve parallel twin linked to a 6-speed transmission. The serial number began NC03-2000017. 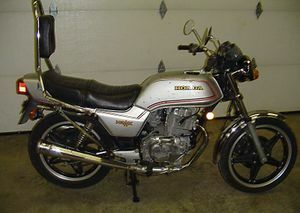 The CB400T'81 was sold in 1981 in one of two available colors: Pleiades Silver Metallic or Black. 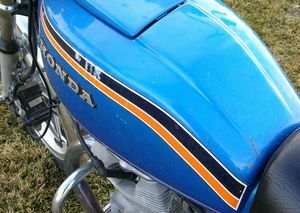 The stripes on the silver bike were black and blue while on the black bike they were orange and blue. The black comstar wheels were highlighted. The brake caliper had a dual piston. 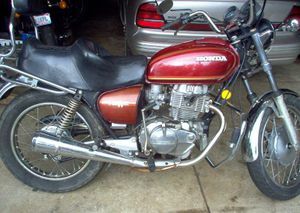 The front fender was painted plastic. The gas tank had a new shape along with a new rear cowl spoiler. 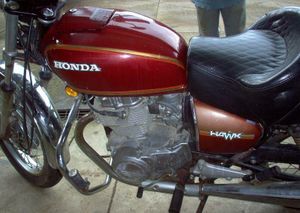 The engine was a 395cc OHC 3-valve parallel twin linked to a 6-speed transmission. The serial number began JH2NC030*BM100001.